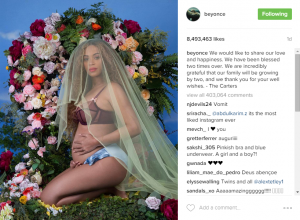 Beyonce Announces Pregnancy with Twins on Instagram. It’s been a rough few months for the Americans, first with the bitterly fought elections, then the shocking new laws banning immigrants from entering U.S.A.For the first time in decades American Elections took the center stage with many celebrities attacking a single candidate with nothing held back. When the election results came as a shocker to many Americans, as Donald Trump became the 45th President of United States of America,many citizens were seriously thinking of shifting to Canada, that the Canadian Immigration website actually crashed. Even as Hillary Clinton quietly faded away into the night..many Democrats felt let down with absolutely no one to guide them.It’s really been a torrid 2 months for that staunch Democratic supporter. Until now, on the very first day of Black History Month when Beyonce took to Instagram to announce her Pregnancy with twins, by sharing a gorgeous picture of hers, showing off her baby bumps,clad in a denim blue shorts & a light brown bra. As she gently kneels down in a hedge of roses while wearing a highly transparent green veil.Not only did Twitter erupt with joy but the whole of America went crazy. For the first time in almost six months Beyonce grabbed the newspaper headlines and the prime time television away from Donald Trump.With many anti-trump activists using this opportunity to take a jibe at Trump’s cabinet. Grannie Maguire, the famous American comedian even tweeted “Sad that there are more Black people in Beyonce right now, than in Trump’s Cabinet”.Social Media’was highly appreciative of the timing of Beyonce’s pregnancy announcement, on the 1st Feb of 2017, the first day of Black History Month, which is celebrated all over the U.S.
Beyonce’s pregnant Instagram pic is THE most viral pic on the internet for the last 24 hours, with more than 8.5 million likes in less than a day of it’s posting. There is no doubt that this pic of Beyonce’s would not only break the Instagram’s record for The Most Liked Pic ever, but would do the same on Twitter and Facebook as well. Pregnant Beyonce pic is shattering social media records as we write this story and could easily be chosen as The Most Viral Picture of 2017. The comments for this pic make this even more interesting, with many of her fans even suggesting, that Beyonce should name her yet-to-be-born twin daughters as Red and Yellow Ivy, since her 5 year old daughter with Producer, Billionaire and Tidal Music Founder Jay Z was christened as Blue Ivy Carter.